At the convention center in Fort Wayne, Indiana, the entire Winter Fantasy convention fits into one hall. Despite the event’s compact size, Winter Fantasy delivers as much Dungeons & Dragons as the biggest table-top gaming cons. 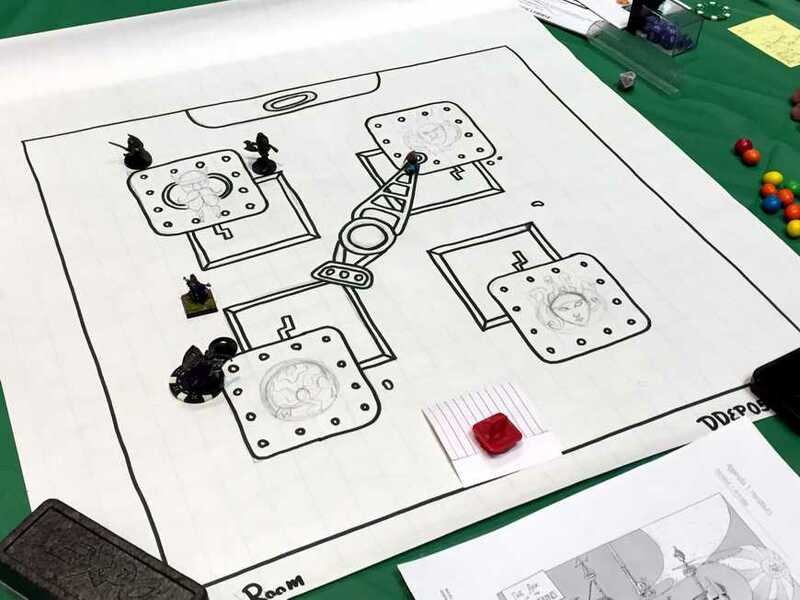 Imagine the D&D track from Origins or Gen Con, complete with a D&D designer or two, the Adventurers League brain trust, and the game’s most passionate players, concentrated in a convention of its own. Plus, the con offers plenty of $99 hotel rooms. Sure, Fort Wayne suffers an icy February, but you come to game. This year, Winter Fantasy hosted 12, 4-hour slots of gaming and I played D&D through them all. This post covers some highlights. An adventure’s written pages only step toward the final product: the play at the table. My dungeon masters and the other player shaped the adventures. We may have steered things in ways the authors never intended. Here, I write about my own experiences at the tables. In Forgotten Tradition, PCs explore a time-lost museum revealing the history of giants and their kin. Some of this adventure’s success rests on the players’ interest in the museum’s lore. I learned a few things. Our DM for Forgotten Tradition admitted to tinkering with the adventure’s final encounter. I have no idea what changes he made—or if they improved anything—but I liked the result. The final showdown pitted characters against a unique, single foe. The creature proved so dangerous that my group chose to run. And then our DM turned the escape into an entertaining conclusion. Reeducation lands the PCs on a mission to rescue Seer, their patron in many earlier adventures. Most of the adventure plays as a dungeon crawl. I like dungeon crawls and I liked the story behind this one, but its challenges seemed suited for characters nearing 10th level rather than characters around level 15. My cleric kept rolling low initiatives, so the fights finished before he could act. The pattern became a running gag. Our DM would shrug and remind us they we already played at the highest difficulty. While my cleric missed turns, another player’s simulacrum took turns. Simulacrum lets you create a duplicate that doubles all your spells and half your hit points. One player gains an extra, second character in the adventure. Yes, I know DMs should scale adventures to challenge an extra character, but the addition doubles one player’s activity at the expense of the other players (me). I’m not sore, just grateful for a start on another post listing most annoying spells in D&D. The first attracted a surge of readers. D&D epics give players an experience they cannot match at home. Epics unite many tables of players together to fight for a common goal. After last year’s Winter Fantasy, I raved about how author Will Doyle delivered the one of the best epics ever with Reclamation of Phlan. This year, Will proved still he knows how to craft an epic. The Ark of the Mountains challenged players to seize control of a airship in time to use it to battle a giant’s flying war galley. I liked how the fantastic premise made the battle extraordinary, even for the a magical setting. Some past epics overreached in adding magic-as-technology to the Forgotten Realms. To me, fleets of airships dropping alchemical bombs belong in Eberron. This event kept a sense of wonder and the flavor of the Realms by making the airship a ancient artifact. The Ark of the Mountains improved on Will’s last epic by adding improvements that made the adventure easier for DMs. Rather than the 50 maps in Reclamation of Phlan, Ark reused just a few locations. At my table, we landed a DM without a killer instinct, so the encounters seemed too easy. What kind of basilisk fails to use its gaze attacks? 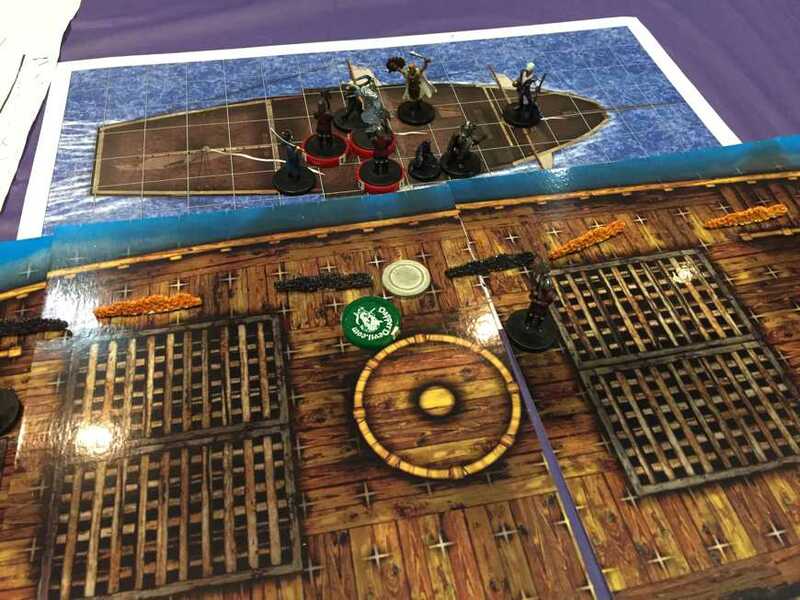 My convention group loves a deadly challenge, so some ranked The Iron Baron as the best session of the con. In this epic, characters raid a fire giant’s fortress. I loved the mix of challenging encounters with varied objectives. During my session, the players won the day, but during other sessions, the heroes fell short. Evidently, epics can be lost, and learning that pleased me. The threat of defeat gives villains credibility and makes the players’ wins meaningful. Some players felt that The Iron Baron lacked interaction—that it felt like we neighbored tables that just happened to be running the same adventure. While events rarely rippled between tables, our head DM did a wonderful job of uniting the room. As our commander he rallied us; as the Iron Baron, he shouted threats, sometimes in the untranslated Giant. In past years, conventions ran each epic just one time and the entire convention played at once. This year, the con repeated its epics throughout the convention for fewer tables. This change lifted a burden from dungeon masters. In the past, the convention drafted every DM to run the epic, forcing each DM to prepare an extra adventure, usually at two or three tiers. Now, DMs running the epic can focus on the event, and free the other DMs from extra preparation. Plus, the epics’ organizers face more manageable groups of players. For Winter Fantasy’s D&D experience, Baldman Games premiered 4 adventures of con-created content. These adventures served an ambitious premise: The PCs find themselves protecting the three candidates running in an election to lead Phlan. Bane, god of tyranny, forces the PCs to prove whether any of the three merits the god’s support. In the first three adventures, the PCs enter dream worlds that reveal each candidates’ fondest wishes, realized in three dystopian versions of Phlan. I have never met such off-beat adventures in organized play. I appreciated how they broke from the more typical session. Of the adventures, The Royal We stood out the most. To start, characters took the roles of commanders on the battlefield in mass combat using simplified Battlesystem rules. Some folks at my table enjoyed the experiment. For me, the scene just showed that if D&D world worked according to D&D rules, battles would look nothing like a medieval clash of arms. After our PCs spent a couple of rounds pounding enemy units with fireballs, they routed. The units represented by cardboard counters on the map barely clashed and never impacted the outcome. However, the rest of The Royal We delivered. The plot moved to a knotty combat encounter that featured foes with clever synergies. Next, we solved an puzzle that revealed a candidate’s backstory while entertaining and challenging us. The final encounter combined a potential fight with another problem to solve. The D&D Experience ended with a special adventure that pitted all the tables against a series of encounters where everyone battled to repel an invading fleet. The encounters felt solid, but the enemy spellcasters obviously never read my post on self defense. Characters built around the Sharpshooter feat dish out so much damage in tier-3 D&D play that no spellcaster can start in the open and stand much chance of casting a spell. Like some past epics, this mini-epic left me wondering about magic and technology in the Forgotten Realms. The ships packed batteries of black-powder cannon. As levels increase, characters gain abilities that let them fly, operate in underwater, and travel the planes. Adventures gain an epic feel by inviting players to use their extraordinary abilities. If PCs just wind up in dungeons blasting monsters—but with higher damage totals—then level 17 feels much like level 1. Eye of Xxiphu delivered an epic feel. Our choices took us into an underwater funhouse where author Merric Blackman seemed to channel a measure of White Plume Mountain with a dash of extra gonzo. I don’t know if any of it had a logical explanation, but I didn’t much mind. When my convention group met the young DM who would run Eye of Xxiphu for us, I worried that running a 2-part, level-17-through-20 adventure for a bunch of old DMs might drag him in over his head. But he showed mastery over the rules and juggled difficult encounters featuring crowds of monsters. This DM boasted a killer instinct. Someone in our group took a risk with something in the dungeon, and our DM said, “You’re dead. No save.” Fortunately, our party included two clerics, so death only slowed us a little. Welcome to tier 4. The adventure climaxed in a set-piece battle with us mounted on dragons—or shapechanged into a dragon—chasing a giant airship as at raced to reach a cloud castle. An epic conclusion to an epic adventure. And to an epic convention. This entry was posted in Conventions and tagged Adventurers League, Baldman Games, Battle Interactive, GEN CON, Merric Blackman, Origins convention, Will Doyle, Winter Fantasy. Bookmark the permalink. Thanks for the report and review. Winter Fantasy looks awesome. Would you be willing to share with all of us the “you’re dead, no save” scenario?